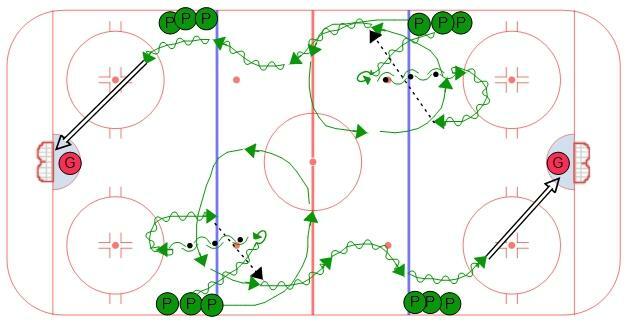 Start Practice with 6 Progressive Over-Speed Hockey Drills | Ice Hockey Systems Inc. Depending on the type of practice you envision you most likely have a bank of drills that you call upon. I typically like to gear the warm towards the practice so that the warm up will not only get the heart pumping a little bit, but also lead into what we will be working on in that particular session. For example, the day before a tournament or a big game we work on special teams quite a bit. 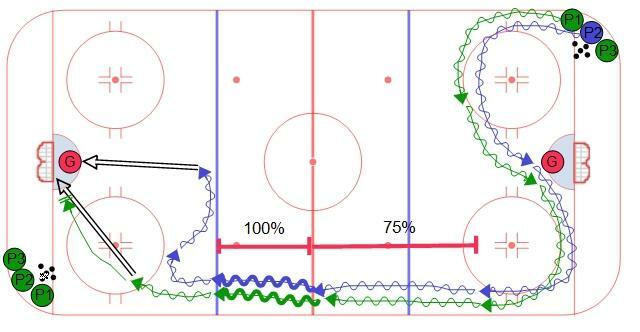 We like to use a warm up in which the players are passing and receiving the puck a couple hundred times. The goal is to get the players a good feel for the puck and mentally sharp. This warm up session that is described below is one that I like to use when we are looking for a high tempo and fast paced practice. It not only focuses on skating fundamentals but it encourages moving the feet at a pace faster than what players are comfortable with. Each drill involved includes a diagram as well as a link to the animation. The players are split up into two groups for the first couple of drills and placed in opposite corners. On each whistle the first two players from each line will go and they will finish at the end of the other line at the opposite end of the rink. This first group of skating drills involve cross-overs around the top of the circle, bottom of the other circle, followed by a particular skating drill all the way down to the other end. The first over-speed drill focuses on cross-overs around four of the circles. Ideally they will go two at a time out of both corners. The route is top of the circle, bottom of the circle, around half of the circle at center ice, and ending by going around the outside of the circle in the opposite corner from where they started. This route is chosen because it allows players to keep their feet moving the entire time. The turns are short enough to where they should not have to slow down too much, yet challenges them enough when their feet are moving. If a couple players lose their edge and fall then they are doing it correctly! Challenge them to move their feet faster then they think they can. View Full Ice Over-Speed Skating Progression #1 Animation. 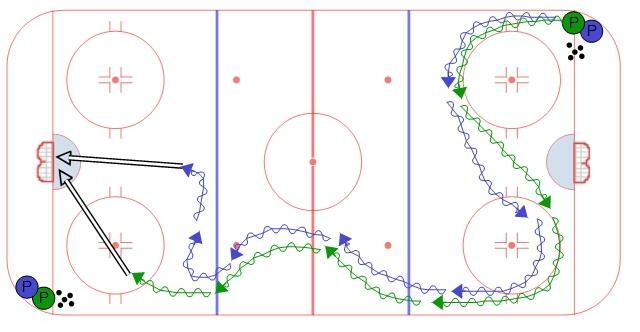 The first over-speed drill is just a skating drill. The over-speed part is focused on the area where the players are going around the top and bottom of each circle. As the players come around the bottom of the second circle and up the wall they need to focus on good, hard, long strides with full extension and full recovery. Their cadence should be at about 75%. 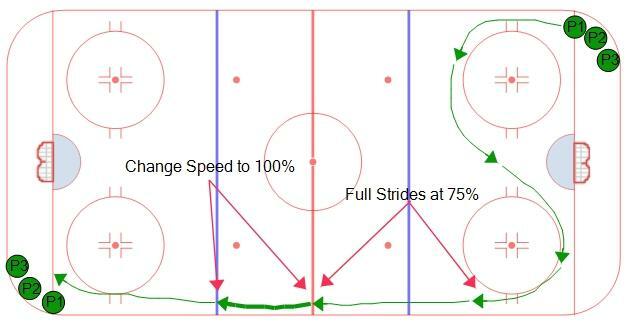 When they hit the red line they should pick up their cadence to 100% without losing their skating form. View Full Ice Over-Speed Progression #2 Animation. 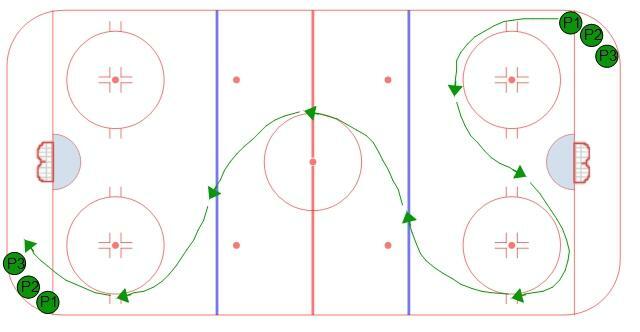 This skating drill starts out the same way with over-speed cross-overs around the top and bottom of the circles. This time as players come up the wall they will do three cross-overs to the inside followed by three cross-overs to the outside. These cross-overs should be at 100% with players focusing on getting as much power as possible from the cross-under. View Full Ice Over-Speed Progression #3 Animation. Now we introduce pucks into the progression. Explain to the players that the puck should not slow them down. Encourage players to push the puck because when they stickhandle it too much it will slow them down. In this progression the players skate the same route as the second progression. So players will come down the outside of the ice pushing the puck and transition from 75% to 100% from the red line to the blue line. Now that they have pucks they will finish the drill with a shot on net. The first player will stay to the outside and shoot a wide angle shot (with their feet moving). The second player will cut to the middle and take a shot from the slot. View Full Ice Over-Speed Skating Progression #2 with Pucks. This progression is the same as #3 but again the difference is that players will carry pucks. In this variation the players are working on lateral movement while carrying the puck. This is helpful when attacking the blue line so have the players work on attacking the blue line inside to outside using the cross-overs. Again, the first player will take a shot from the outside lane and the second player will use their inside edges to gain the center of the ice for a shot from the slot area. There is one more drill to cap off this warm up series that ties everything together and adds a pass into the drill. Move both lines up to the blue line with pucks. The first player starts out by skating in a circle as shown in the diagram. The second player carries a puck out to the face-off dot, transitions backwards, controls the puck backwards, and times their transition forwards so they can make a flat pass to the forward. Again the focus is over-speed so it is important that the first player keep their feet moving. 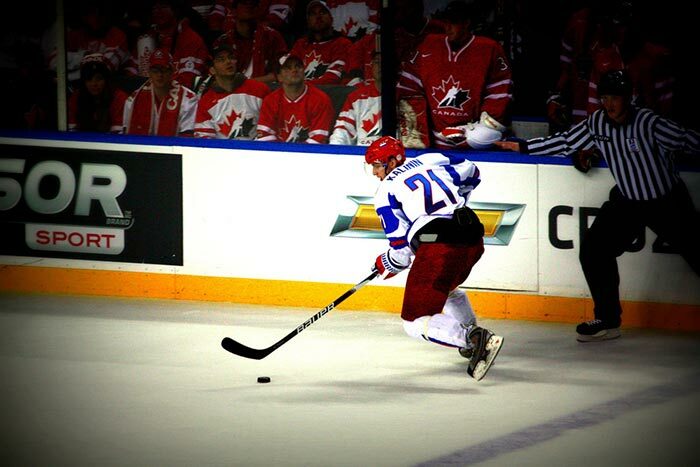 They should also face the puck at all times by opening up their hips as they look for a pass from the second player. 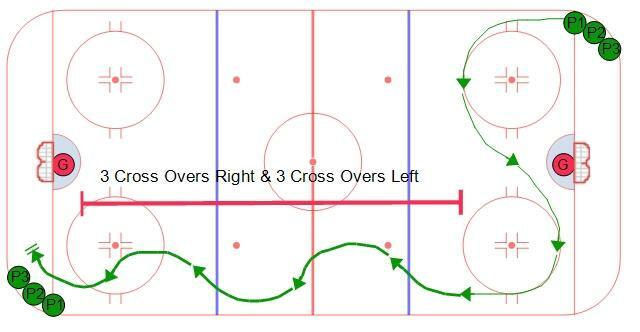 Once player 1 receives the pass they work on their lateral movement by attacking the blue line inside to outside using cross-overs. If they are on their forehand side they should drive wide and take a wide angle shot. If they are on their off-hand then they should cut to the middle just inside the blue line using their inside edge. View the animated Neutral Zone Over-Speed Transition.